I've read through the documentation, looked at the custom settings, but I'm stumped. This org is using the 1-to-1 Account Model, and it's my understanding that A4S is supposed to automatically detect that. This is a new error and we've been using A4S for years. Any help is much appreciated. I've been able to figure out the problem. occurs if you are not using the Household Account model. 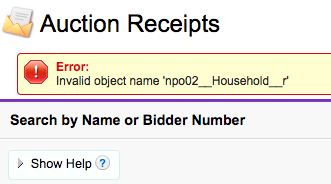 The code is trying to validate security on npo02__Household__r.Name, and needs to treat this as npo02__Household__c.Name. I'm working on a fix and will let you know when it is available. Fixed in version 4.22 push upgraded on 4/11/2019.